this might help a little bit for you. x2 i have a 4th gen with 17 and 225 45 17 size tires. getting rims bigger than a 17 will not have near as much rubber between the rim and the pavement meaning it will ride rougher. Why did you do an R34 conversion...? That's like, a lot of money wasted lol. If you wanted to do a conversion, you should of done a DC2 conversion. Anyway, whatever rim size you want...16" and 17" look the nicest on Preludes. if you have that r34 kit on, i would definitely go with an 18" rim with no lip to make the rim look bigger, just my opinion. Throw some D's on that b!tch. 22s will fit. Whether or not you'll be able to drive the car is another matter, but then again you didn't specify you needed to do that; just asked what the biggest rim you can fit is. Just get a tire with a bigger sidewall to pick up the height a little. I'm about to get 17x10 +35 5Zigen FN01R-C wheels wrapped in 235/40 Toyo Proxes T1R's...5mm Spacers up front; hopefully it's as hellaflush as I imagine it being. 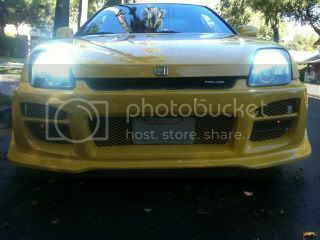 That's not an R34 conversion...It just has an aftermarket R34-ish front bumper slapped on a Prelude. 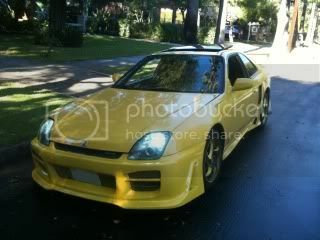 I like the color, as there's not many yellow Preludes; but that kit is pretty rice, at least in my opinion. Get some spacers when you get your new wheels. It'll help them flow with your body kit better. the 45's will raise you that much more off the ground. I had 205/60r16 on instead of the stock 205/50 (not my doing btw) and it was a good amount higher. what rim size u have?? Not totally true. Get the right offsets on your rims and you can run 16's that are flush no problem. Each wheel will look different and depending on your taste will provide that yes or no value. I have to say that I to like the color, different for sure. U think i should get spacers???? EDIT: I should of mentioned, it doesn't say anything like; "choose such and such tire size, with this rim size...", it explains everything, so then the replies in this thread can make some more sense. Last edited by Vanz__; 12-08-2010 at 02:42 AM. I didn't say anything about spacers. 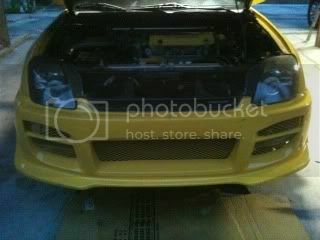 I said get your rims with the right offsets and they will be flush if you choose 16's or 18's doesn't matter. Is that a GT spoiler, if not, what is that? Any side pictures?